Don’t give up 4K HDR content just to be able to record your gameplay. With 100% lag-free, 4Kp60 HDR video pass-through, the LGU allows you to enjoy the mesmerizing 4K HDR gameplay and record at 4Kp30. The LGU takes full advantage of UVC technology, which basically standardizes video drivers. In other words, all you need to do is plug your LGU to your PC and it’s ready to record and stream. First in its class! RECentral is the first gaming capture software able to record HDR content. Moreover, it doesn’t stop there, RECentral is also able to simultaneously stream to multiple platforms. For more information, click here. Are you thinking about editing your 4K videos but don’t know where to start? We’ve got you covered. The bundled CyberLink® PowerDirector™ 15 is a feature-packed, intuitive 4K video editor to kickstart your editing skills. Features • 4Kp60 HDR: Pass-through vivid 4K HDR while recording at 4Kp30. • High Frame Rate: Record Full HD video at 120 frames per second. • Ultra-Low Latency: Enjoy playing on RECentral preview screen with virtually no latency. • Plug and Play: Convenience at its best, just plug it and done. *The LGU does not support macOS. 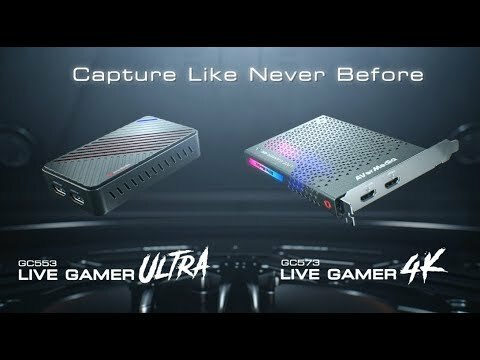 • Live Gamer Ultra (GC553). • Type C to Type A Cable. Important – Please Note: *H.265 Compression is supported by RECentral. *We strongly recommended to use Intel chipset. *LGU does not support USB 3.1 Gen 2. *LGU does not support USB 2.0. *LGU does not support viewing/recording/streaming of HDCP protected signals.